September is a great time for everyone to get back to business. Whether you are returning to school, renewing your fitness resolutions, or incorporating a new and improved healthy diet into your lifestyle, the fall season is the perfect time to establish a new routine. This special time of year is also perfect for new yoga students to embark on a journey into yoga, however, with the variety of yoga styles to choose from it can feel a little overwhelming to know which classes to take. It might be of comfort to learn that each class builds upon common and basic poses. 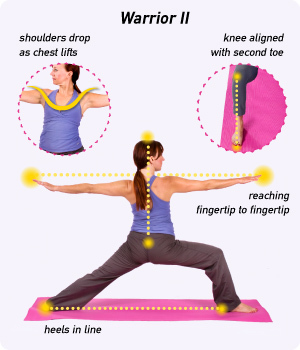 All of our classes at Heart and Core Yoga studio offer a crossover in the occurrence of these basic poses. Once you get familiar with them, you will have a strong foundation from which to build your practice. In addition, all yoga poses can be modified to suit the needs of the varying levels in yoga classes. While each pose may share the same components, no two yoga poses will look exactly alike. Every body is different, therefore each pose will also vary slightly. The following is a list of five basic yoga poses you’ll likely come across in all classes, plus special tips on how to perform correctly, and how they benefit the mind and body. With both hands and feet on the mat, this pose affects all the muscles in the body. In our Vinyasa yoga classes, this pose is often revisited over and over again. It is also the most recognized pose, as well as the one people think of or call attention to when they speak about yoga. Tips: It is not a crime to have your heels lifted and knees bent in this pose. The importance is in keeping your hips high and your spine long, not curved. Benefits: Lengthens and decompresses the spine, stretches the hamstrings, strengthens the arms, flushes the brain with oxygen, calms the mind. This is a great pose for all levels. 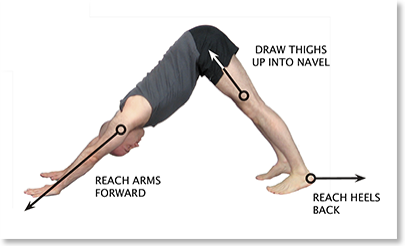 Certain yoga styles offer variations of this pose, but it’s easily recognized, as the components are very similar. Tips: Practice this pose as if your back is up against a wall. Keep your shoulders over your front leg. Resist tipping forward, instead turn your chest open toward the ceiling slightly. Benefits: Slims the waist, strengthens the legs and core, aids in correcting postural imbalances. Looking dynamic and powerful, it’s no wonder we see these poses in a lot of yoga ads or commercials. They exude self-assurance and poise. By practicing Warrior I or II, one feels like a warrior! Tips: Keep your front knee directly over your ankle. Maintain an upright position with both shoulders over your hips. Straighten and root down with your back leg firmly. Keep shoulders relaxed down and away from your ears. Benefits: Strengthens the legs and hips, stretches the psoas muscles, instills a sense of confidence like a peaceful warrior. This pose is often used as a reprieve from the challenging moments in yoga. It is recommended to visit this pose as often as needed when you need a little rest break. 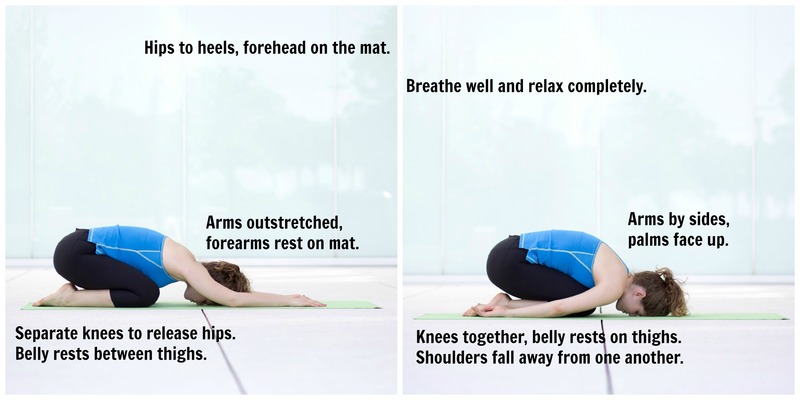 Tips: If you are unable to rest your forehead on the mat, rest it on your forearms, a yoga block or a folded blanket. Benefits: Stretches the low back and hips, calms the nervous system, stimulates the kidneys and relaxes the spinal muscles. Otherwise known as Savasana or final relaxation, this pose is the single most important one you will do in your yoga practice. It happens at the very end of class and is what makes your hard work worth it. Tips: To fully experience this pose it is important to let go of all agenda and savor just “being” rather than “doing.” For some, this pose will be the most challenging to master. It requires a level of surrender that may seem counterintuitive in our busy world. Benefits: Lowers blood pressure, relaxes heart rate, calms the mind and makes you fall in love with yoga. These five poses lay the foundation for many yoga class routines. Variations will often include some twisting, extending or balancing in different ways, but by mastering the basics, the next steps will come naturally.